Are you planning to go out for Halloween and still procrastinating about what costume to wear? If you are like most people, chances are you probably delayed picking a costume until the tail end of October without much time to spare. But don’t stress about it. 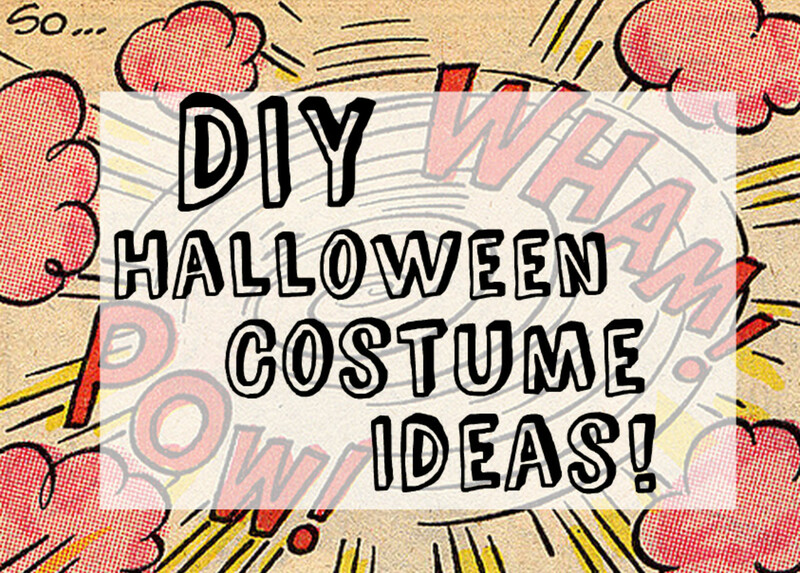 Fortunately, there are lots of easy last-minute Halloween costumes for adults that you can create quickly using only a few simple DIY materials. You will be amazed what you can do with just a cardboard box, paint, makeup, fabric, household goods and a cheap trip to the dollar store. All you need is a little bit of creativity and some of these components to make a funny Halloween costume. 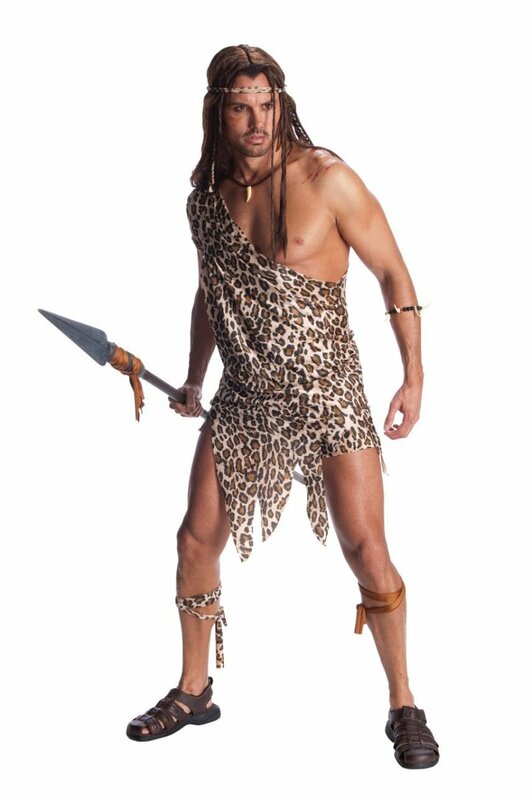 Many of the costumes described in this article can be adapted for men, women, and even children. 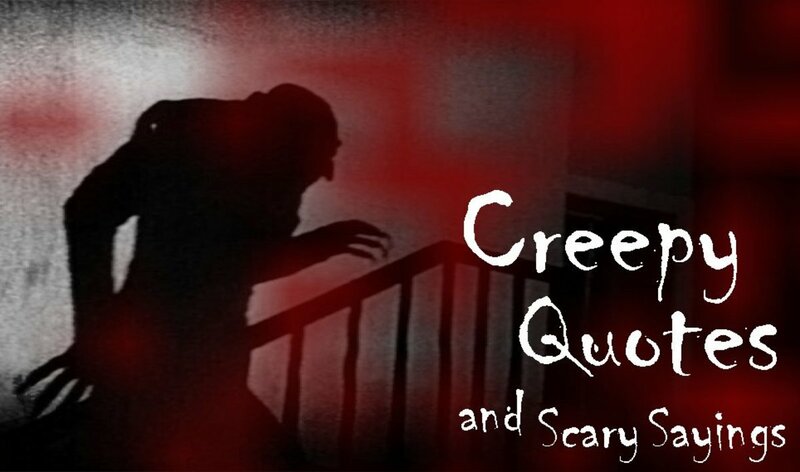 Browse through the 99 costume ideas below and choose one that you like the best. Find a plastic doll and remove the arms and legs. Fasten the arms to your ears and attach the legs to the bottom of your face. Put a baby soother in your mouth for an extra accessory to complete the look. Remember Zach Galifianakis in The Hangover? Remove the head from a doll and put the doll’s arms and legs through a baby backpack. Wear the backpack in reverse around your neck and stick your head through the top so it looks like you are the baby. Put on all of your clothes backward. If you want to get more creative with it, find some party glasses with eyes and wear them on the back of your head! Wear a baseball jersey and ball cap. You could also carry around an inflatable (or real) bat and take a ball with you. Wear a jersey and take a basketball with you. Wigs and other gear are optional. Wrap a big box with birthday paper. Put holes in the box for your arms and legs. Tie a bow around your head. Fasten a birthday card to it and ask for autographs. Dress like one of the character’s from the Intel Blue Man Group. Simply paint your face blue and wear black clothes. Put on a brown afro, beard, glasses, and a classic Bob Ross collar shirt. If you don’t have painting supplies, make a palette out of some cardboard. 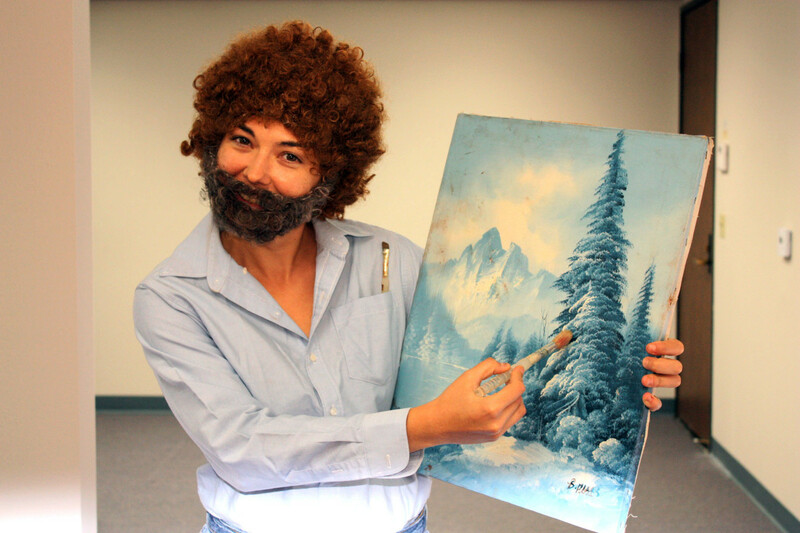 People will be asking for your “happy little trees” all evening! Put on a night robe or a hoody with baggy athletic shorts. Make some fake boxing gloves with garbage bags filled with crumpled newspaper or bubble wrap around your hands. Paint your face half blue and half white. This works best if you have long hair like Mel Gibson did in the film. Paint your nose black with some whisker streaks protruding from it and onto your cheeks. Add some eyeliner to make it look like cat’s eyes. Put on some plastic cat ears or create some using a hair band. Wear a T-shirt with the phrase “Go Ceiling!” It can’t get much easier (or lame) than that! Get some pom poms if you want to go the extra mile. Create a mosaic of large square pixels on a large piece of cardboard. The squares should be different shades of skin tones. This will create the illusion that your body is naked but digitally censored. Attach the cardboard to the front of your body with string around your neck. Wear skin-colored clothing for a more realistic effect. Don’t forget your soap and puffy bath pouf. Attach empty boxes of cereal to your clothing. Stab them with plastic knives and glue the knives so that they stay protruding out from the boxes. 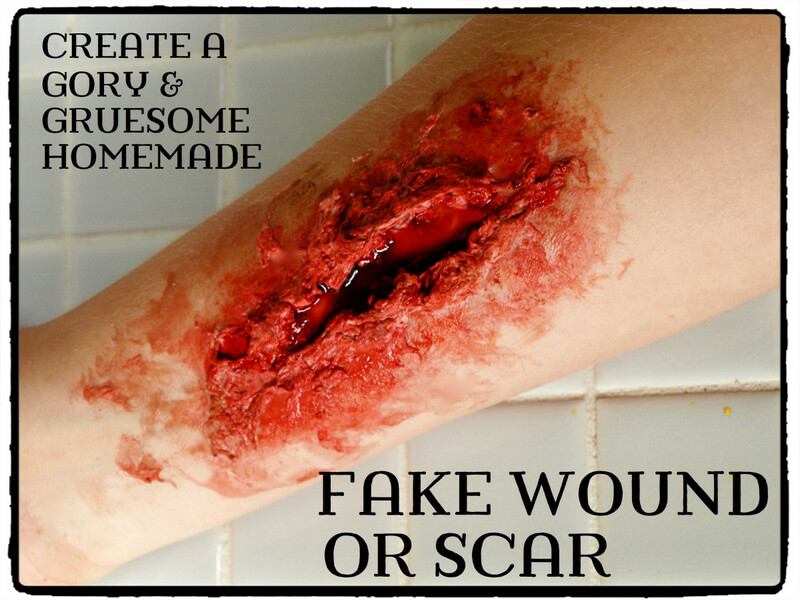 Apply red paint to the “stab wounds” to resemble blood. Find a plain yellow T-shirt. Sew on black fabric or use a felt marker to draw the up-and-down black pattern around the lower portion. Wear it with some black shorts and brown shoes. Wear a classic Charlie Chaplin outfit, including the black hat, jacket, and baggy pants. Paint on the tiny mustache and don’t forget the cane. Put on a white sweater, skirt, high socks and pick up some pom poms. Paint your face white with the appropriate colors around your eyes and mouth. Put on a red clown nose and a bright colored afro wig. Wear some bright colored baggy pajamas and big shoes if you can find them. Carry some balloons around with you. Fold a large piece of bright paper back and forth so that it resembles cupcake paper. You may be able to use a big cardboard box for this and put the color on with fabric or other materials. Put cotton at the top and attach colorful balls on for the sprinkles. Finally, step inside and attach it to your body. Get some cheap plastic devil horns and paint your face red. Attach a devil’s tail on the back of your pants and carry a plastic pitchfork. Throw on a white doctor’s coat or lab coat. Put a stethoscope around your neck. Same as the one above. However, instead of the stethoscope, put a real chilly pepper around your neck with a string. On the other hand, you could carry a pepper shaker around with you all night! 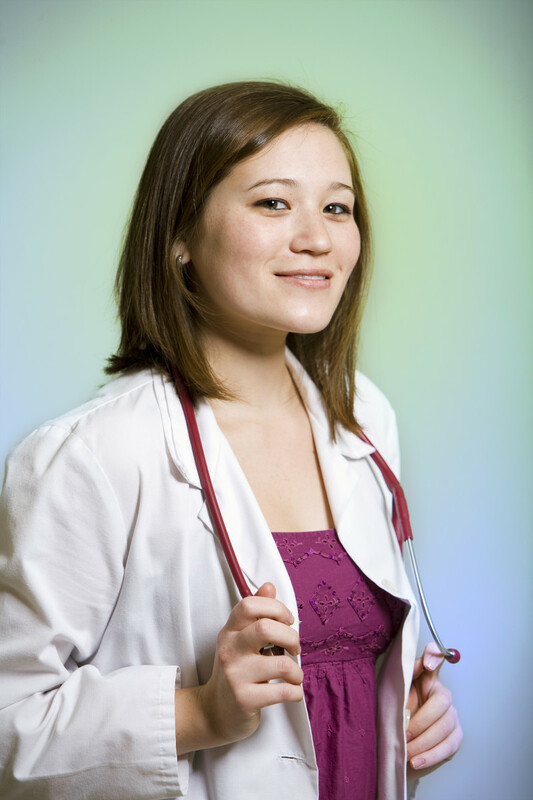 Put on a white doctor’s jacket with a name card that says “Who” on it. Paint your face orange, put on a comb-over wig, business suit, and red tie. Put pants on your arms and boots on your hands. Put a coat over your shoulders with a bag (or blanket) fastened to the end of the arms of the coat. Conceal your legs in the bag (or under the blanket) while you “walk” with your hands. Make some fake pointy elf ears with masking tape (or scotch tape). Wear a white chin-strap beard and a cone-shaped hat. Write “Error 404” and “Costume Not Found” on a white T-shirt. Quick and easy. Write “BOOK” on your face. Walk around asking people to like you. Eventually, people will clue in. Cut a hole in the bottom of a large plastic pot. Buy some cheap plastic flowers and attach them around the inner edge. Step inside and puncture holes through the edges of the pot where you can slide rope through. Use the rope to suspend the pot on your shoulders. Throw on a football jersey and carry around a ball. Shoulder pads and other gear would help complete the costume so it looks more authentic. Give yourself a unibrow with some face paint that matches your eyebrow color. Put flowers in your hair. Try to match Frida’s wardrobe if you can. Pull a green sweater over your head so that the neck portion flops out like a mouth. Get someone to attach two ping pong balls on the sweater for the eyes. Remember to put two black dots on with a marker for the pupils. 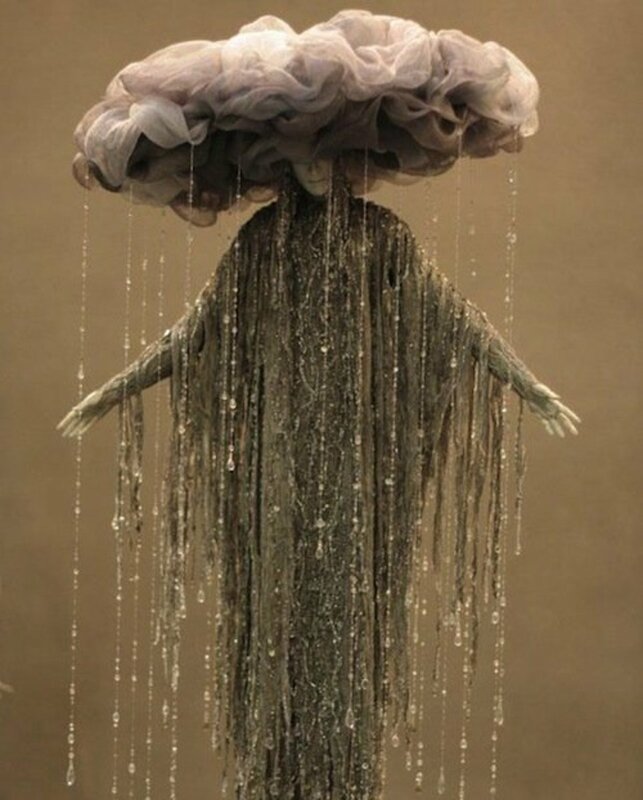 Go as a classic Halloween ghost. Throw a white bed sheet over yourself. Don’t forget to cut out two holes for your eyes. This works if you have “gingerly” hair. You could always put on a wig if you don’t. Hang some bags of bread around your body. If you think people won’t understand, make a sign that says “Gingerbread Man” and it should get you more sympathetic laughs. Find a cheap white dress and apply mud to it in all the appropriate areas. Try to make it resemble the one from the film. Put your hair in front of your face or buy a wig that matches the character. Put on the typical golfer outfit, including a golfer hat, collar shirt, pants, and shoes. Take a plastic golf club with you if you would rather not haul around your 14 piece five star set of clubs. Blow up a bunch of purple (or green) balloons and attach them to your body. Paint your face green so it looks like a grape stem. Carry around a glass of red (or white) wine for some extra giggles. Throw on a hockey jersey and you’re all set. If you want to add to it, paint your two front teeth black and wear some hockey gear if you have some. Wear dirty looking clothes, a wool hat, and a scruffy fake beard. Carry around an empty liquor bottle in a paper bag. You could also put a cardboard sign on your chest saying that you’ll work for spare change. It would be ideal if you had a shaved head to pull off a Homer lookalike. If not, put on a shower cap and paint it similar to your skin tone. Draw the lines of hair on your head (or a shower cap) with face paint. Put on a short-sleeved white shirt, blue pants, and black shoes. Grow a circular beard around your mouth or apply face paint. Donuts are an appropriate addition. Put on a classic Hefner black and red bathrobe. Get a bunch of ladies to accompany you all night. Buy some cheap sticky name card stickers at a dollar store. Write random people’s names on them and stick them to your clothes. Carry some extra blank name stickers for people to add to your body later. This takes a bit of preparation, but it can be done quickly enough. Find a big jacket that you can wear so that the top covers your head. Fill the shoulders and arms of the jacket so it looks like your real body is inside. With a clothing hanger wire, attach a hat and glasses so that it creates the illusion of an invisible face above the jacket neckline. Dress yourself in all red clothing and put a red laundry basket on your head. Wear a plaid dress and a white apron stained in ketchup. Carry a plastic knife covered in red paint. Make a large red circle with cardboard and draw the iconic Kool-Aid face on the front. Wear a long-sleeved red shirt and red pants. Finally, hang the Kool-Aid face around your neck. Paint a big cardboard box any lego color. Glue six plastic or paper bowls on the outside so that it looks like lego. Paint the bowls the same color. Cut out holes for your legs, arms, and head. Put on a wool hat and fake beard. Wear a plaid shirt with jeans and suspenders. You can make the ax out of cardboard paper or improvise with other materials. Dye your hair blue and apply lots of hairspray or gel to keep it up. Wear a green dress, red shoes, and red necklace to match Marge’s appearance. Put on a black shirt, red shorts, black stockings and yellow shoes. Make Mickey Mouse ears using cardboard or by designing them using a hair bad and black duct tape. 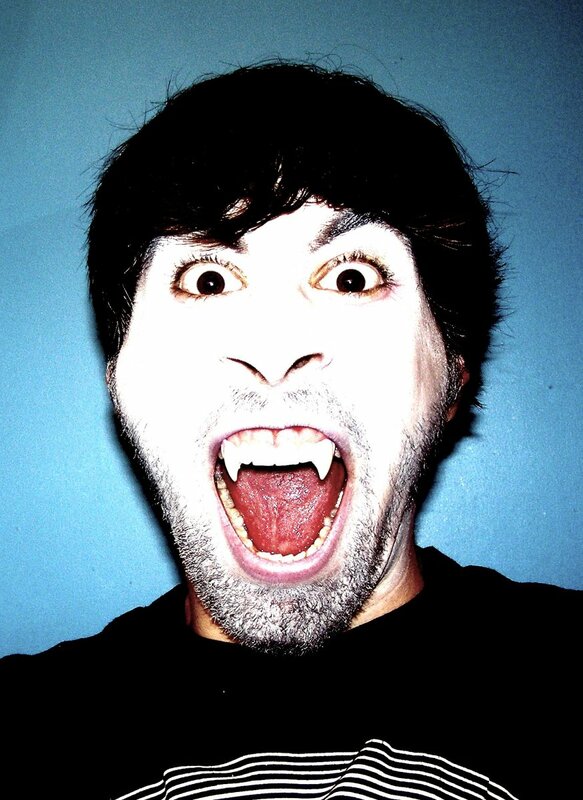 Paint your face white with black highlights around the eyes and mouth. Put on some white gloves with a black and white striped shirt. Going as Mr. Clean for Halloween is even easier if you already have a shaved head. If you want to keep your hair, just put on a shower cap. Then, all you need is a white shirt, white pants, white shoes, white face paint for your eyebrows, and some clip-on earrings. Wrap toilet paper around your body and walk with your arms out all night. Put on a “Vote for Pedro” T-shirt, jeans and thick glasses. If you don’t have a fro for it, try to find a wig to go along with the outfit. Don’t forget to lift your upper lip and expose the front two teeth to get into character! Make a cylinder out of a cardboard box and wrap string around it several times. Fasten it over your shoulders with more sting or something else to secure it. Make the “needle” with a wire clothing hanger. Wear a white short-sleeved shirt and a bow tie. Put a calculator or pens in the breast pocket and tuck in the shirt so that your pants come up really high past your waste. Comb your hair down the middle or give yourself a bowl cut for the night. To complete the look, find some thick glasses at the dollar store. Dress in all black. Wear a black robe with a sash. You can use a black beanie for your head and a black scarf or cloth to cover your face. Make a sword out of cardboard and tin foil. With a large cardboard box, create a “nightstand” table with a night lamp on top of it. You can glue other objects on it, such as a fake alarm clock, photo frames etc. Cover the box with a tablecloth and cut a hole in the middle for your head. Stick your head up through the hole and put a lamp nightshade on for a hat. Dress yourself from head to toe in black. You could wear black spandex tights over your head or apply face paint. Next, create a large yellow diamond-shaped sign using cardboard paper. You can make a handle using a string through the paper. Hold it behind your body so it appears like a pedestrian crossing road sign. Use That 70’s Show as a good reference. Basically, put on a big-collared shirt and some bell bottoms and you should be good to go. Put on some tight pale blue jeans, converse shoes, and other 80’s style attire. Don’t forget to go crazy with the hairspray to match the era. This costume may take more time than the others to make, but it is well worth it. First, fasten a large pillow or cushion to your back so that it rises above and behind your head. Put a long-sleeved jacket on the pillow and stuff the sleeves full of something. 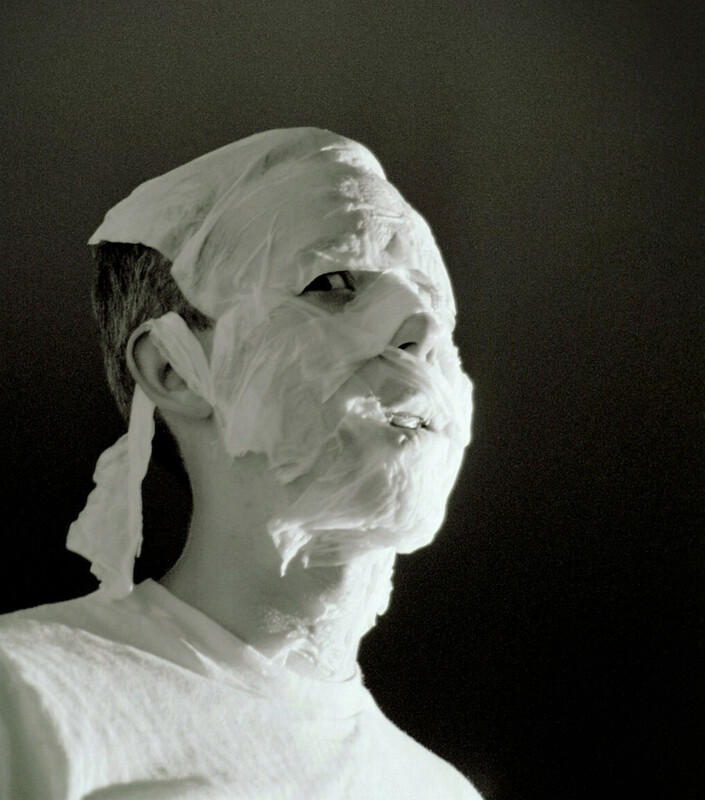 Next, attach a dummy head (or mask) so it appears as if it is coming out of the jacket neck. Finally, stick a big cardboard box against the pillow and stick your body through the box so that it looks like you are inside the box and the dummy character is carrying you. Remember to make sure that the arms of the stuffed shirt have gloves attached which “hold” the box. Make a huge triangle out of cardboard. Decorate it with paper cheese, pepperoni, and mushrooms. Attach it around your neck with some string. Dress in all black then attach sticky Post-it notes all over yourself. You can carry a collection of blank Post-it notes for people to stick to you all night! Remember the film about the albino with superpowers? Shave your head and put on some white face paint. Throw on some shades. Find an orange garbage bag and make holes for your arms and legs. Put it on and stuff it with crumpled newspaper. Draw the eyes, nose, and mouth on with a black marker or black tape. Hang pictures of men from an umbrella with fishing line or thin string. Wear a white and black striped shirt. Hang a whistle around your neck. Paint a Rubix Cube design on a large cardboard box. Cut holes in the box for your legs and head. Join two empty 2-liter plastic Coke bottles together with tape. Paint them silver if you want. Attach them to your back (over your shoulders) with string. Wear black clothing and put on a scuba mask. Buy a cheap plastic doll and take off one of its arms. Paint the end of the arm red. Next, wear a large shirt so that only one of your arms comes out a sleeve. Hold the severed doll arm with that hand while your other arm is concealed on the inside of the shirt. This may take some artistic skill to pull off a realistic appearance. Paint your face white, then add the black areas with black paint so that it looks like a skull. Dress yourself from head to toe in black. Paint a paper plate yellow and paint on the classic smiley face. Attach the plate to your face with a string around your ears. Put on a soccer kit and tape a ball to your foot. Wear military-style pants, a jacket, and black boots. You could also put a black plastic bucket upside down on your head for the helmet. If you want the plastic green toy soldier look, spray paint everything green and apply green face paint. Buy a plastic toy gun at the dollar store. Dress in white and draw a black stickman on the white clothing with a black marker. Alternatively, you could use black tape. Draw a simple smiley face on a white paper plate and attach it to your face. Create a Superman symbol with cardboard or paper and stick it on a blue shirt. Put on the shirt with red shorts, tight blue pants, and red boots (or socks). Use a red blanket for the cape and secure it on the back of your neckline. Wear a long white shirt and attach an orange pillow to your back using a dark green sash or scarf. Carry some chopsticks with you. Buy any version of Time Magazine or print out a template from online. Paste it onto some cardboard and cut out a hole for your face to appear on the cover. Cut a square out of a big piece of cardboard. Cover the brown parts of the cardboard with white paper and create the same design that you see on the Tinder app. Fasten the cardboard to your stomach or at your waist. People will be swiping you left and right all night! Cut out holes in a big cardboard box for your legs. Cut a small horizontal area at the bottom where people can insert tips. You can take whatever they give you with your hands inside the box. Don’t forget to write “Tips” with an arrow pointing towards the insertion area. Cover a big cardboard box with some simple polka-dot birthday wrapping paper. Label it “Tissue” or “Kleenex” so it is more obvious. Cut out a hole for your head at the top and remember to attach some white wrapping paper so that it extends out from the hole behind your head. Wrap yourself in a toga and party like John Belushi for Halloween. Apply makeup or face paint to one half of your face. Get creative. There are infinite possibilities! 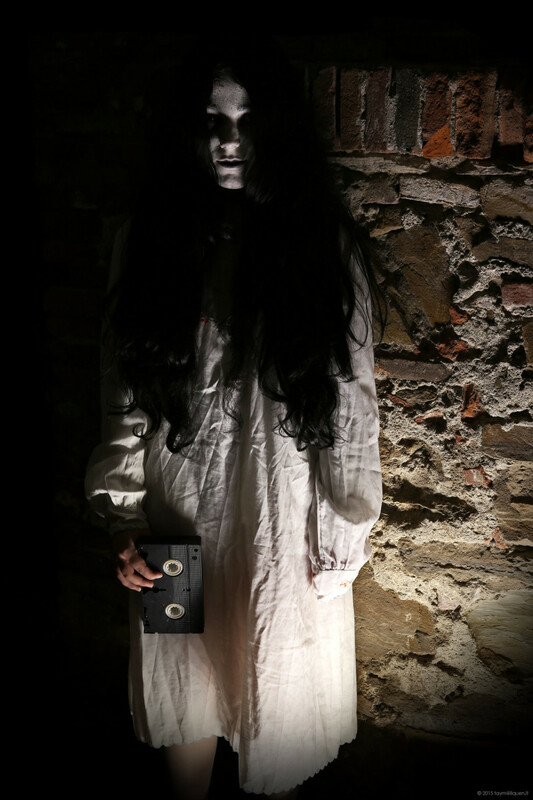 Get a large long-sleeved shirt and attach a dummy head or mask at the neck portion of the shirt. Insert your legs through the sleeves. Next, put big gloves on the end of your feet. Then, put some pants over your head so that your arms fit through the ends. Finally, put shoes on your hands. With some adjustments, put your hands in the air so it looks like the dummy is walking upside down. Throw on a flower shirt, sunglasses, a fanny pack, and other touristy gadgets. You could even put on some sunscreen patches to your face or paint on a fake sunburn. Paint your face white and put in some fake plastic vampire teeth. The Dracula cloak is optional! Tape your ears with masking tape or scotch tape. Apply makeup so that the color matches your skin tone. You can then use face paint or makeup to make your eyebrows pointy. Find a collared shirt with green and white vertical stripes. Put on some pants with suspenders over the shoulders. Then, attach some “flare” by pinning several buttons along the suspender straps. Wear a white and red striped shirt with the hat to match. Put on some round black glasses, blue jeans, and brown shoes. A brown cane would complete the outfit. Make a 6-sided die out of a big cardboard box. Cut holes in the bottom of the box for your legs and a hole in the top for your head to come through. Make four holes in a black garbage bag for your legs and arms. Stuff the bag full of something light, such as crumpled newspaper. Tie the top so it is secure around your neck and shoulders. Your head can come out from the top along with some newspaper and other types of garbage fastened to the inside of the bag. Again, this works best if you have a shaved head. Use face paint for the goatee or grow one yourself. Find a black hat and glasses to go full Heisenberg. Yellow overalls for the cook would complete the look. Remember Wilson, the neighbor, from the TV sitcom Home Improvement? Put on a fishing hat, plaid shirt, and carry around a mini fence made of popsicle sticks. Hold up the mini fence so that only your eyes are showing. Pick up a witch hat from a dollar store or make one yourself out of black fabric. Put on some black clothes or a drape a large black sheet over yourself with a sash around your waist. Don’t forget the broom! On a white T-shirt write “Life” with a black marker or with black tape. Carry around a bag full of lemons and offer them to people. Make a Yip Yip Martian character from Sesame Street. Throw a blue furry blanket over our head and body. The length of the blanket should reach down to your feet. Attach two ping pong balls (or something similar) to the top of your head for the eyes. Inside the blanket, you can position your hands in front of you so that it looks like the mouth of the character is moving. That completes the list of easy last-minute Halloween costumes for adults. 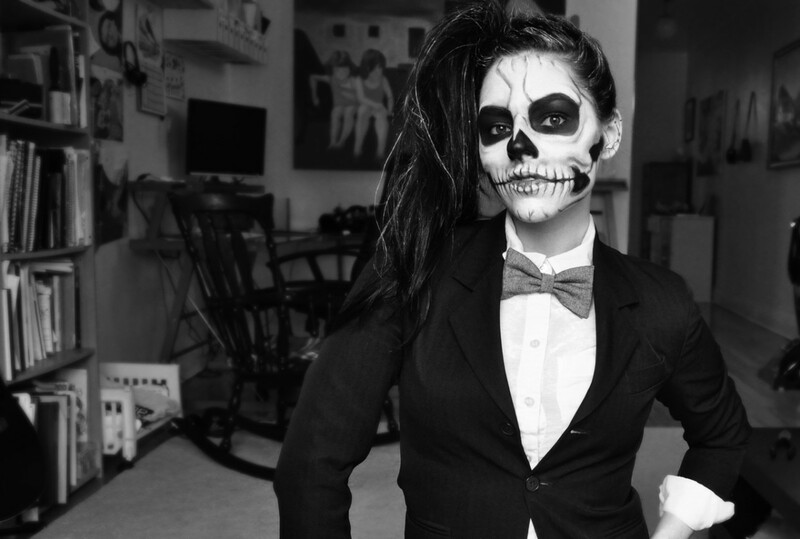 Do you have any other clever costume ideas for Halloween? Share your comments below and join the discussion. 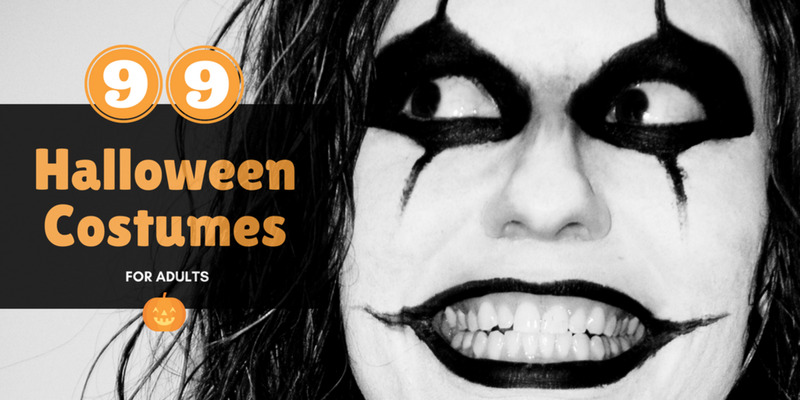 Will you wear 1 of these 99 costumes for Halloween this year? Maybe. I'm still on the fence. VIDEO: How to Make Halloween Costumes Out of Candy! Costume Ideas Starting with the Letter "T"